The World Health Organization (WHO) recently issued new guidelines that strongly recommend a reduction in the daily intake of “free sugar” to less than 10 per cent of the total energy requirement. It has also made a conditional recommendation of further lowering free sugar intake to less than 5 per cent per day, which is approximately 25 grams or 6 teaspoons for a moderately active child and adult. Free sugars are defined by WHO as monosaccharides such as glucose and fructose and disaccharides such as sucrose or table sugar. Free sugars also include natural sugars present in honey, fruit juices, syrups and fruit concentrate. Sugar-sweetened beverages (SSBs) and packaged foods contain high amounts of sugar. According to Francesco Branca, director, WHO’s Department of Nutrition for Health and Development, there are strong evidences to prove that a decrease in sugar intake can reduce the risks of overweight, obesity and tooth decay. WHO guidelines are aimed at reducing the risks of such non-communicable diseases (NCDs). The problem of sugar intake is also reflected in a Delhi High Court ruling of March 18. Acting in response to a public interest petition of 2010, the court issued an order restricting junk food in schools. As per its verdict, the guidelines prepared by a committee set up by the Food Standards and Safety Authority of India (FSSAI) in 2014 should get implemented as regulation across the country within three months. One of the recommendations is to regulate the availability of junk food in schools. But this is not enough. Mere regulation of junk food could still leave room for its high consumption as FSSAI guidelines are not clear on the frequency of consumption and availability. What is needed is a ban on junk food in schools. While WHO has strongly proposed less than 10 per cent of free sugar intake, health experts in the country say that we should aim for the conditional recommendation of less than 5 per cent and avoid SSBs such as soft drinks and packaged juices to meet the target. This is a practical suggestion as a typical Indian diet is rich in carbohydrate that gets converted into glucose, fulfilling the sugar requirement. There is no need for added sugars from processed and packaged foods such as chocolates, biscuits, soups and juices, says Seema Gulati, head, Nutrition Research Group National Diabetes, Obesity and Cholesterol Foundation (N-doc), New Delhi. A 300 ml cola drink, for example, contains about 33 gm of sugar. Consumption of one such drink per day leaves no room for sugar from any other source as additional sugar is likely to add to obesity. Non-carbonated fruit drinks also contain similar or even higher amount of sugar. A 300 ml serving of the mango drink, Slice, contains about 45 gm of sugar. Sugary drinks such as colas and juices should be a big no, says Rekha Harish, head, pediatrics department, Government Medical College, Jammu. Many processed foods contain hidden sugar to curb the unpalatable taste of preservatives. A teaspoon of tomato ketchup which is not considered sweet contains about 4 gm of sugar. It is, thus, important for the consumer to understand the exact amount of sugar present in such foods with reference to the recommended intake. Consumer awareness through detailed and clear labelling about the nutritional content can encourage people to opt for healthier alternatives, Gulati says. The Delhi High Court judgement recommends strengthening of labelling regulations by making nutritional information vis-à-vis the recommended daily allowance more prominent. A “front of pack” labelling prevalent in countries like the UK, Denmark, Sweden and Norway could be adopted in our country to support the labelling regulations. Advertising goes a long way in shaping consumers’ preferences. The court judgement also orders the regulation of advertisements and endorsement of junk foods by celebrities, especially those targeted at children. Canada, England, France, Sweden and Norway already have restrictions in place against the promotion of unhealthy foods. Gulati emphasises the link between high sugar intake and increasing risk of NCDs. Diabetes has reached epidemic proportions in India; 65 million people were affected by type-2 diabetes in 2013. “Major portion of high sugar consumed in the urban setting comes from sugar-sweetened beverages,” she adds. NIN recommends 30 gm of sugar on an average per day for adults and children, says K Damayanthi, scientist at NIN. This is close to WHO’s recommendation. But sugar consumption in the country is increasing, resulting in health problems. 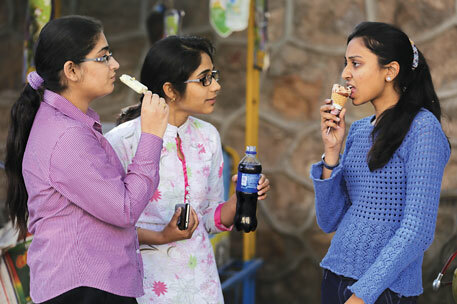 “Sugar Intake, Obesity and Diabetes in India”, a study conducted by Gulati and Anoop Mishra, director and head, Department of Diabetology, Fortis Hospital, in 2014 found an increase of 10-65 per cent in obesity and overweight in the country as recorded in several Indian studies between 2005 and 2013. Gulati’s study cites an industry publication, according to which the volume of carbonated soft drinks in India nearly doubled between 2008 and 2013 and is projected to increase by over 47 per cent in 2018. Damayanthi agrees. “The intake of refined snacks and soft drinks is increasing in urban India, with adolescents being the most vulnerable to this kind of foods,” she adds. Such grim statistics need to act as alarm bells and encourage people to give up on SSBs and packaged juices. “These drinks are empty calories and should be completely eliminated from the routine diet of children. And even if these are eliminated from school canteens, there should be some regulation on bakeries and vendors in the vicinity of schools,” Damayanthi says. She adds that traditional home-made food and snacks that have more fibres and proteins should be preferred instead of unhealthy food. Industry initiatives to reduce the high sugar present in SSBs have been limited. When asked about their nutritional value, Arvind Varma, secretary general, Indian Beverage Association, says that the focus of the industry is on balanced diet. One, however, fails to understand what nutrition can sugary beverages containing only high calories provide.